Slide Title: Dennison Theatre 1935 Slide Caption: Student Union Building, 1935. Photo by R.H. McKay Archives & Special Collections, Mansfield Library, UM. Used with permission. Slide Title: Dennison construction Slide Caption: Construction of the Student Union Building. Archives & Special Collections, Mansfield Library, UM. Used with permission. The Dennison Theatre, connected to the Fine Arts Building, will enter its 80th year of use in 2015. While the purpose of what is now the Fine Arts building has changed over the years, the Dennison Theatre (formerly the University Theatre) has always been an integral part of the University of Montana Campus. In its early days, the University of Montana lacked a student union building. Students in need of supplies were restricted to a rudimentary bookstore, referred to as “an old shack,” behind Main Hall. By the early 20th century, student union buildings were becoming increasingly popular across Britain and the United States. In 1927, Dr. J.P. Rowe of the University of Montana’s Department of Geology visited one such establishment at Cornell University. His enthusiasm for the idea, as well as faculty feeling that letting students seek entertainment in Missoula’s downtown was dangerous to their “moral well-being,” combined with student wishes for their own gathering place. In 1928, a $1 dollar per quarter fee had been instituted to help raise funds for UM’s first student union. The decision to include a theatre in the new building came very early. The Masquer Theatre Organization, having produced a “Juno and the Paycock” with the help of the Abbey Theatre in Dublin’s own Lennox Robinson, had brought national attention to drama at the university. As such, students strongly felt the need for a designated performance space. 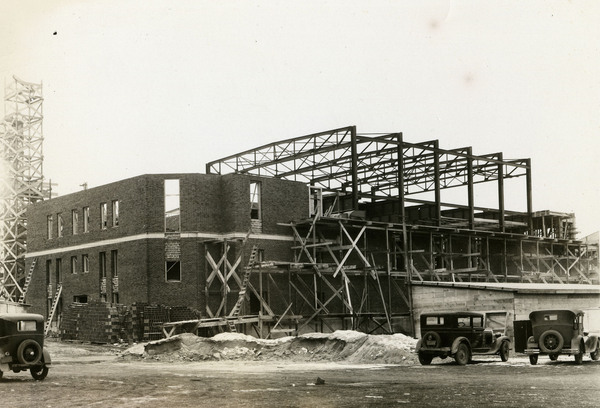 In 1933, the National Recovery Administration Committee approved a $300,000 loan for the construction of the Student Union Building. Out of this, $60,000 came as a Public Works Administration grant, making the new building the first structure on a college campus to be built with PWA funds. While excitement for the project was initially high, plans for the building had to be significantly revised. In early versions, the desired theatre space alone would have cost half loan amount. With revisions completed, groundbreaking took place on July 24, 1934. The building was designed by Missoula architect C.J. Forbis and constructed under the direction of contractor J.E. Hightower. 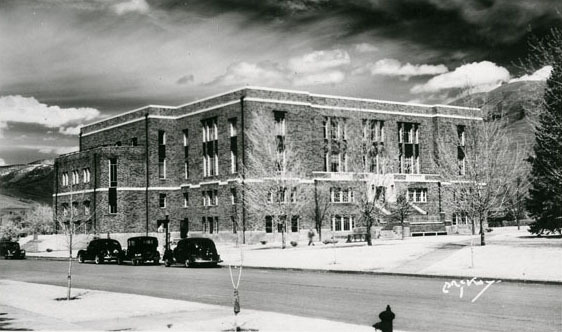 On November 11, 1935, the Student Union Building opened and was presented to the students. Prior to the opening, there had been some discussion of naming the building after the late and celebrated University President Charles H. Clapp. During his lifetime, Clapp reportedly commented “Thank God, no building will ever carry my name.” Apparently the message was heard, as the Student Union Building was not, in fact, named after him. The new Student Union Building featured ballrooms, lounges, meeting rooms, a bookstore, a malt shop, and, of course, its theatre. At the time known as the University Theatre, it was the largest theatre in Missoula. With 1480 seats, it could hold the entire student population. By the late 1940s, enrollment had spiked and a new student union was needed. The Lodge (later to become the Lommasson Center) replaced the Student Union Building, which became the Fine Arts Building. This change provided a much-needed home for all arts classes, formerly scattered across campus. Also at the time, the bookstore was converted into the 70-seat Masquer Theatre, forerunner of today’s Masquer Theatre in the Performing Arts/Radio-Television building. In 1998, renovations updated the Dennison Theatre and provided ADA accessibility, allowing for larger shows and continued use. The building received its new name in May of 2012. The University of Montana’s tradition of drama and performance began in 1904 with the formation of the Quill and Dagger. This became the Masquer Theatre Organization, which had its first home in Simpkins Hall, before moving into the Dennison Theatre. Over the years, hundreds of performers have appeared on the Dennison Theatre stage. Some are listed below. Vincent Price, Percy Grainger, Marcel Marceau, Ladysmith Black Mambazo, Jesse Jackson, David Copperfield, Pearl Jam, all the U.S. military bands and choruses and many of the leading modern dance companies.